Forum Index > Historical Arms Talk > knights templar and armour, proffessional or hand me down? Posted: Tue 05 Jul, 2016 6:24 am Post subject: knights templar and armour, proffessional or hand me down? the contention arises in this form. That's St. George, as you might guess from the halo. While individual Templars were sworn to poverty, the Order itself was filthy rich. There are a number of surviving regulations for arms allowed and required of the Templars. The problem with vambraces being that they only show up right around the time of the dissolution, or shortly thereafter. where can i find copies of those regulations, or if they are hard to find what do you know about whats in them? These regulations were updated from time-to-time, so later versions exist. It seems likely that purchased arms might be functional, but less expensive versions. For example, a pair of plates would be covered in fustian rather than velvet. Gifts, such as arms left from wills might be slightly outdated, but still functional. A rich armour given as alms might be sold to buy two less decorated versions. Booty acquired from battle might include items of mail, or simple helmets. The regulation also provides for Turkish arms and crossbows to be passed down to the segeants and infantry. It's perhaps best to think of Templar Arms as "government issue". Each knight is responsible for maintaining what he was issued, but the house maintains the right to take it back and reissue it at will. As long as the armor remained functional, it would have seen use, but this doesn't preclude the purchase or acceptance of more modern pieces of gear, as long as they are modest. The military orders were probably the most professional standing armies of the early medieval era. And as such also an early example of a "teeth and tail" style military outfit. As part of that, at least in their major centres (such as Krak des Chevaliers and later Rhodes and then Malta for the Hospitallers), they all maintained completely self-contained communities that included their very own personal (i.e. Order) armourers to MAKE their armour. Exactly. Outremer was, especially at times of war, quite a difficult place to import larger quantities of stuff from Germany for example, where many new defensive equipment was developed, but a few examples is enough for smiths in Orders command to copy this new stuff. No decoration is ok for modesty purposes, but not less functional. From what I've read about the Hospitaller's time on Rhodes, much of their arms and armor were either hand-me-downs or purchased from Italy (most likely from Genoa, as they were frequently at odds with Venice). So, probably not the latest-and-greatest, but whatever they can get a a good price, and whatever they still have that is still serviceable (waste not, want not, after all). There was still a hierarchy within the Orders, so I'd wager a high-ranking knight, or the one in charge of a wealthy commandry would have newer and nicer equipment than a lower knight who didn't have his own commandry, who'd have nicer equipment than a lowly sergeant. Now, a lay brother, who only joined up for a pre-determined short period of time and never took the full vows, I'd wager they'd likely just use their personal equipment from their secular life. I may be wrong about that, but as far as I know, the Templars were an elite force exclusively dedicated to the heavy cavalry. They didn't need infantry because, in general, their role was to reinforce a already existing crusader army, which, on the other hand, had their own infantry. Still, I wouldn't be surprised if sergeants sometimes dismounted to fought as heavy infantry if the occasion demanded. About recruitment: do you like Game of Thrones? The Night's Watch has some inspiration on Templars. Knights who had been convicted of crimes such as murder, assaulting travelers in roads, heresy (if they repented), or other illegal activity could escape from a death penalty or loss of their chivalric status joining the Templars. I don't know if the Teutonics and Hospitallers also did this kind of recruitment, but recruiting ex-robber barons were a nice way to increase their numbers. Of course, this also decreases their respect in homeland Europe: Saint Bernard de Claivaux, the creator of the Order's Rule, even compares them to Apostle Paul (in the sense that they abandoned their activities that usually molested christian people to do something "greater". From persecutors of the God's people to heroes (now they stopped being a trouble for local lords to do even worse in muslim's lands) . About other forms of recruitment, they were done in Europe itself. Knights and other nobles invited to join the Order, offering indulgences for their service. Like other monks, they were organized in Priories: even Ireland had Templar's Priories. There they got both financial means and soldiery material for their purposes. In Portugal it was also common for Kings to give lands, castles, outposts and piories as rewards for their service in the Reconquista. Some people call Military Orders' government over these lands as some kind of "alternative feudalism". Military Orders also composed the main forces at the marches, where christian lands found muslim ones. The text to the left in the Apocalypse, Cambridge MS Mm.5.31, fo.139r, specifically describes these figures as being from the Hospital of St. John, Knights of the Temple, and Teutonic lords. I would be surprised if there as any indication about how the Templars felt about ailettes. It's one of those details that will probably be forever unknown in history; at best, we might hope to get the view of one or two Templars who wrote down their personal opinion as an aside. 1. Ailettes don't appear until after c. 1275, so they would be a late arrival if they were used by Templars. 2. The primary function of ailettes appears to be as heraldic identifiers from the side. Since Templars don't bear their individual arms, and fight in units which are already easily identifiable, there may be little need for ailettes. It is impossible to say with certainty, but the pattered double lines at the chest remind me of similar lines on the the Løgumkloster and Magdeburg St. Maurice figures, which wear coats of plates. I would argue that the white figure is wearing a coat of plates, but accept that other interpretations are also valid. Since when the Hospitaller Knights wore green tunics? I also argue that it's impossible to be only an oddly artist's way to represent a common surcoat, just see the knight on the left, he wears a plain surcoat, easily identifiable. Although there is no 100% definitive proof of that plates's evidence, the artist definitely wanted to highlight something different. That's weird. Not one of them is wearing hospitaller colours or Teutonic. Godfrey de Bouillon, Advocatus Sancti Sepulchri in the red surcoat and crown carries the arms of Jerusalem. (Though the arms of Jerusalem is supposed to have gold crosses on a white field, they are shown in this manuscript as red on pale green.) 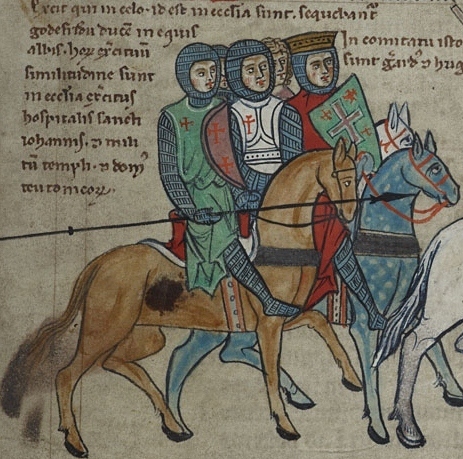 The army behind him consists of "hospitalis saneh johannis" (Hospitallers), "militū templi" (Templars), and "dom' teutonico", even though there are only two armed figures in the front and a third in mail coif behind. 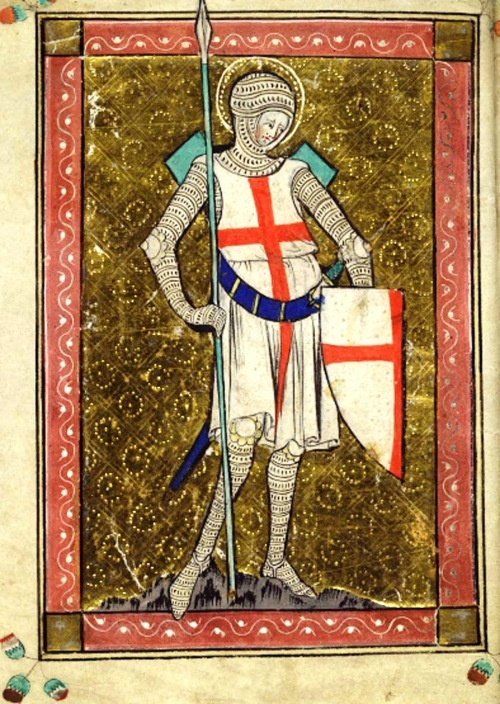 if we accept that the Templar is wearing white with the red cross, the red cross on green surcoat is either supposed to be a Hospitaller (white cross on red by this time), a Teutonic Knight (black cross on white), OR a "generic crusader" who has taken the cross and follows the military orders into battle. Consider this proof that miniatures are not photographs, and that the miniaturist had limited color choices. Consider a child in school who only has a box of wax crayons with 8 colors instead of the big box with 64 choices. They still draw the picture.